My parents’ house had been on the market for a long time – any time I started to think about it too long, I imagined it like a fish at those markets in Chinatown, where they are laid out on newspaper and at the end of the day, their scales are imprinted with the ink from the page, and the shopkeepers hose them out into the sewers. My parents’ house reminded me of a rotting piece of fish, but it made sense for me to go and stay there. Being back in the neighborhood was strange, in an awful and disconcerting sort of way. My entire street had changed since I had gone off to college. And my two best friends, who lived in the house across the street and the house two down and on the left, respectively, had died. They had gotten married five years before, but no one had been invited and I only recently forgave them for leaving me out – we were the type of trio that you read young adult books about, or make bad romantic comedies about. Paulina and Paul and me; we held hands when we walked places. People speculated whether or not we were kissing one another behind the third grade bungalow, which was where we hung out during elementary school and played Crazy Eights (until third grade, and then we moved on to Poker and secret cigarettes). For a brief period, when we all went to community college together, we shared a bed and I thought I was in love with Paulina, and then Paul, and then I was in love with neither of them and they weren’t in love with me, and I fell in love with Caroline and that’s when we grew apart. But like a rubber band, after we stretched, we snapped back together. For a while we were a foursome with Caroline, and then a foursome with Nadia, and then, slowly, they were a twosome and I was just a me-some and we only came together once or twice a year. It was very sudden, when I think about it now, sprawled on the floor of my room, wishing I hadn’t made my parents give away the rug I used to keep here. Paulina had made it for me, from carpet swatch samples. They started to cook for one another, and I couldn’t cook. I tried to pick up baking, but the charred muffins and blackened pie discs were not something to bring to them. I started to make myself unavailable, and then I didn’t have to try very hard. And then they got married, and then got themselves killed, and now here I am. I started to pack after their funeral, put my clothes back in my duffel and my suit back in its suit bag, knowing full well that it was no longer just a suit, it was a funeral suit. I couldn’t bury my two best friends wearing a suit and then wear that same suit to pick up girls or ace an interview. I’d probably find pebbles from the cemetary in the lining of my coat and flub my answer on why I’d be a good addition to the company, or the bedroom. When I sat down on my bed to contemplate how to spend the six hours from now until my flight back home, I saw movement in the backyard and felt my stomach clench and my feet get tingly, like I was on top of a building and thought about jumping off the ledge. The hairs on my neck stuck up and I walked out into the yard carrying my half full coffee mug, ready to splash intruders. 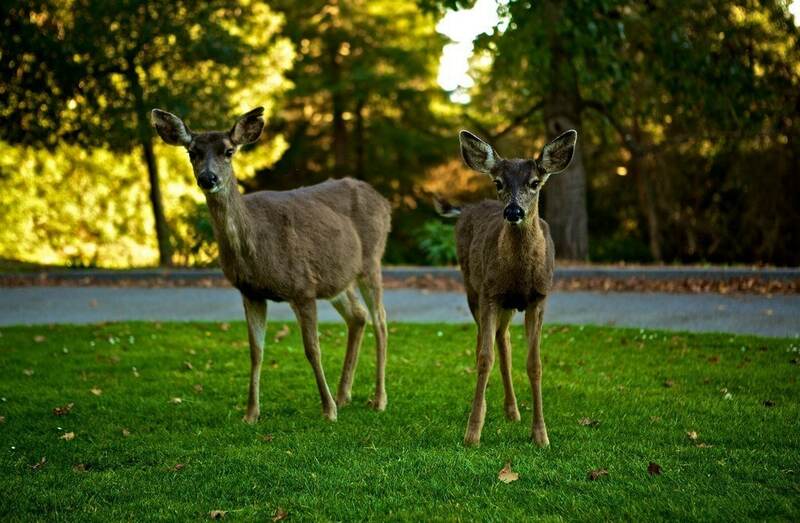 Two deer stared at me from their spot on the grass. Neither of them chewed anything, neither gave me that look associated with headlights. Instead, they both just stared as I sipped my lukewarm coffee and then sat down to cry. I wondered what the deer were doing there, and I wondered if they had anything to do with how clipped my parents’ lawn had stayed after years and years of neglect. The bigger of the two deer licked my face while I cried, which I thought was incredibly odd behavior. He smelled like a mix of grass and an attic that you’ve just opened up to air out and I suddenly wondered if he was thinking about eating me, which was stupid. And then the other deer flopped down on its side sort of like a dog and then curled its legs underneath her, like a deer, and I pretended with every fiber of my being that this was Paul and Paulina. “Hello, you gentle creatures,” I said, still not daring to lay a hand on them. I tried to stay as still as I could. “I’m glad you had each other in the end, but I wish I had gone out with you two.” The one I called Paul licked my middle finger reassuringly. Paulina stayed in her weird, very essence-of-deer sitting position. “Should I stay here for a while, you two?” They cocked their heads in response. I didn’t know what to do, and I didn’t care. Even if they were only deer, I had my friends back. I went back inside and poured coffee into mugs for everyone. Posted on Sunday February 20th, 2011 Wednesday March 26th, 2014 by Max Elman. This entry was posted in Favorites, Photos & Stories and tagged coffee, death, deer, friendship, funerals. Bookmark the permalink.